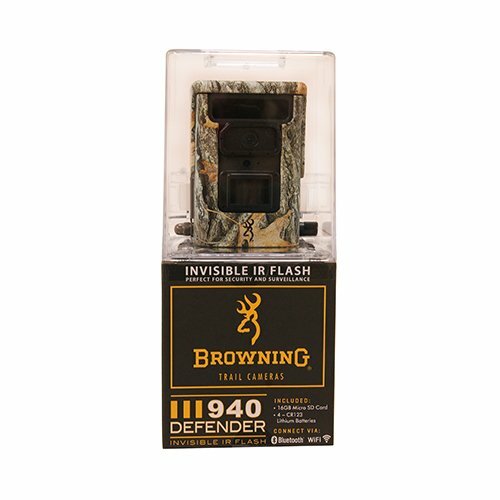 You can view or download your trail cam photos remotely via Bluetooth or WiFi connectivity with the Browning Defender 940 Trail Camera. The camera features a passive infrared motion sensor with an 80′ detection range and a fast 0.3-sec trigger speed, and captures still photos up to 20MB and HD 1920x1080p video (with sound) in response to subject movement. The Browning Trail Cameras mobile app, available for free on Google Play and the App Store, allows you to take advantage of the Defender 940’s Bluetooth and WiFi capabilities. You can view and download photos, change camera settings, and preview its field of view from 60 yards away, without having to physically touch the camera. You can also use SDXC memory cards up to 128GB as the medium for the camera’s images and video. A 16GB SDHC card is included with the camera. The camera’s invisible infrared LED flash offers Power Save and Long Range settings with a maximum range of 80′. Timelapse Plus shooting mode captures images at pre-set intervals over a designated period of time while still taking PIR-triggered shots, and Browning’s BuckWatch Timelapse Viewer Software enables you to see patterns and change over that period. The camera is also capable of capturing up to 8 images in Multi-Shot or Rapid Fire modes, ensuring that you don’t miss the action. The Defender 940 runs on 4 included CR123 batteries.